Nora May is four. As with any toddler, her mood fluctuates between lovely and sweet to hot prehistoric mess. Because of this, I cherish getting to read her books and put her to bed. Once in the glider, she usually calms down and begins to return to human form from whatever pterodactyl roots she had been accessing during the protests of having to “potty-wash-brush” (shorthand for the nightly routine in our household). 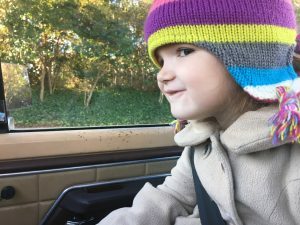 Recently, we had a slightly different experience, which began when Nora May kept putting her finger up to her nose and then shaking her head. Before continuing with this episode I should tell you that, like many youngest children, she does a fair amount of shenanigans to distract us from the bedtime process. I knew to stay the course. Don’t look…sniff…Don’t comment…shakes head…Don’t take the bait. Finally she said, “Mommy my finger is STINKY.” To which I responded, “Well, even if it WAS stinky you always wash your hands when we potty-wash-brush so it should smell like soap, which smells lovely! Now let’s read.” sniff. sniff. sniff. Me: What is it, child?!? NM: My finger smells like poop. Me: Why does your finger smell like poop? NM: Because I stuck it on my bum. Well now, everything is crystal clear, isn’t it? It seems that when you are four and you are bored because your mom switches the loads of laundry while you go potty, then the only logical way to pass the time is to stick your finger on your bum to see what it smells like. Unfortunately for everyone involved, hand soap is no match for this scent and you may need a deep clean to return to smelling like roses. You may think that I am going to connect this to some deeper reality about not going places you don’t want to have the aroma of, but really I just wanted to say: that’s nasty y’all. Think twice before shaking a toddler’s hand for realz. This is one of the funniest, if not the funniest, short essays I have read. I just read it to Richard, and laugheped even harder that the first time! You have such a gift for writing, and I have enjoyed, thorOughly, your writng of a more serious nature.